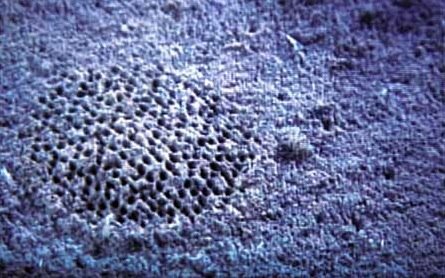 If ‘cereologists’ (people who seriously think that crop circles are made by aliens) knew about deep-water trace fossils, I am sure at least some of them would argue that these structures must also be the work of extraterrestrial intelligence. Many of the traces are so intricately constructed that they raise the question: how is it possible for a not-too-brainy animal to create such patterns. 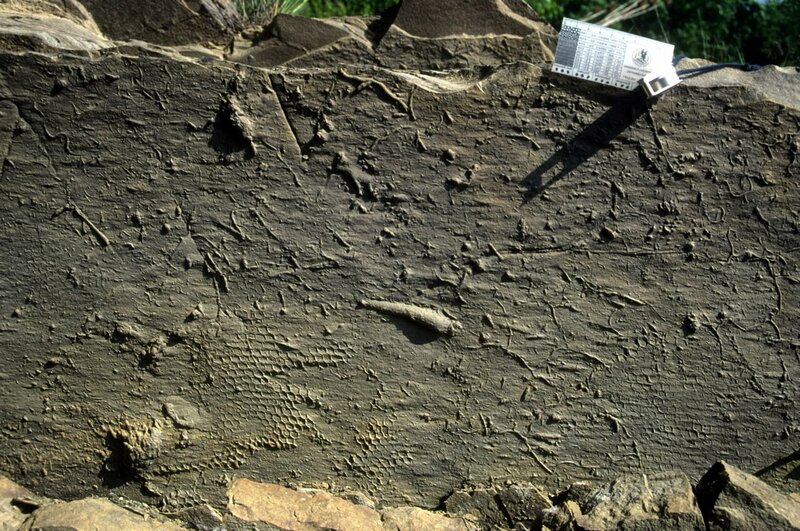 This group of trace fossils is called ‘graphoglyptids’ (don’t ask me why) and they are usually found on the soles of turbidite sandstones, layers of sand deposited in the deep sea (that is, in water depths of more or much more than a few hundred meters). Their shapes can be relatively simple meanders, can include multiple levels of meandering, meanders with bifurcations, spirals, radial patterns. 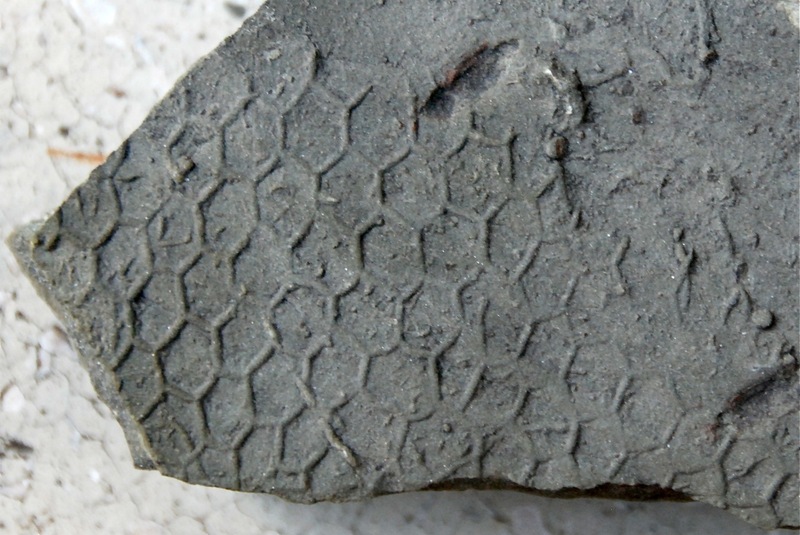 The most interesting and most famous member of the group is Paleodictyon, an easy-to-recognize trace fossil with almost perfect honeycomb-like hexagonal patterns. Many years ago I was lucky to do some work on trace fossils of the Carpathian flysch with two of the best trace fossil experts; since then I haven’t worked with trace fossils but now I wish we did more documentation of the trace-fossil-rich outcrops in the Romanian Carpathians. The Paleodictyon pictures below show turbidite sandstone soles from the Buzău Valley; I haven’t been there for a while but I hear that many of the outcrops are covered now. This story is fascinating as it is, but it is best to see it in amazing colors and resolution, in the IMAX movie “Volcanoes of the Deep Sea“, a documentary about the black smokers of the Atlantic and the discovery of modern Paleodictyon. The mystery of the tracemaker of Paleodictyon – and all other graphoglyptids – remains unsolved: despite the outstanding success of taking IMAX-quality pictures at the bottom and the middle of the Atlantic Ocean, no animal was ever found in the sediment samples, and we know much more about how actual crop circles are generated than we do about the behavior of Paleodictyon. 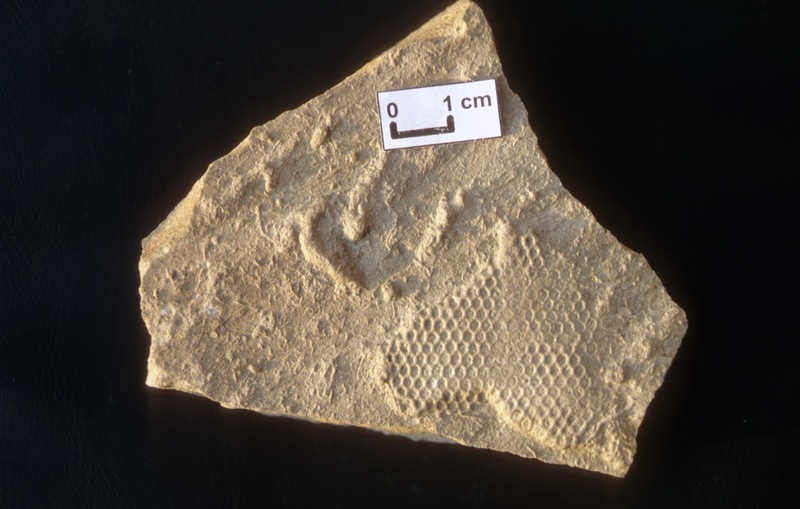 Where exactly in Romania can these trace-fossils be seen? I’m planing to travel to Romania at the end of this month for 3 weeks. Among other locations I am planing to see the Apuseni Mountains, Bucarest, Cluj, Bacau (my girlfriends hometown), Costeneti and the Danube Delta. If anyone of the sights where these can be observed are on or close to my travel route perhaps I could make a small detour to take a look. great post … I’ve never found a Paleodictyon myself … but, then again, it is certainly possible I simply missed an example right under my feet. Lost Geologist — you would have to drive through the Buzau Valley, which is somewhat out of the way if you are going from Cluj to Bacau. From Cluj you could go to Brasov and then (through a village called Prejmer and a town called Intorsura Buzaului) you would get across the Carpathians following the Buzau River, and end up in the town Buzau. From there, you would have to drive north to get to Bacau. The turbidite outcrops in the valley are all over the place, mainly roadcuts; the pictures largely come from an outcrop that is very close to the Siriu Dam (at the end of the lake). However, my father told me that many of the outcrops are in pretty bad shape now, I am not sure whether you can still find these beds. If you want more info, let me know.Brian – I have only seen Paleodictyon & co. in the Carpathians; never seen them in California, Texas, Chile, Ireland, Karoo, etc. Also, I do not know of papers documenting *nice* graphoglyptids from any of the non-European famous turbidite localities. I am not sure why this is the case — maybe it is an issue of having real deep and relatively distal basin floor settings represented in the rock record. It does not sound like we will be pasing by close. I took out a map and it is completely off your route unfortunately. We won’t have a car but will have to travel by train. What a pitty really. I think I’ll see enough impressing geology on the trip though in the Apuseni mountains. Yes, it is much further to the south than you need to go. However, the Apuseni Mts. are not bad either… And you will still have to cross the East Carpathians somewhere. Have a good trip! BTW, I forgot to ask, is there anything in the places I told you that we will go to that would be worth seeing from a geologists point of view or a good book about Romanian geology that you can recommend? I realize now you are going to Bucharest as well… If you take the train from Brasov (or Cluj) to Bucharest, you should stop in Busteni and do a hike in the Bucegi Mts. This is a big pile of spectacular conglomerates, and a very alpine landscape, about as good as it gets in the Carpathians. I saw Busteni the last time I was in Romania. Also we saw the conglomerates and I had a hard time convincing my girlfriend it is not a sort of concrete. :-DIf you could still recommend me one or two good papers. I am curious esp. because I might be going to the country once or twice a year. Thanks! Those things are definitely weird – and it’s very interesting to find them near active sea-floor hydrothermal vents. Lost Geologist – a good source of papers on Romanian geology is this page. One that is not listed there but is the definitive paper on the Transylvanian Basin is:Krezsek, Cs. & Bally, A. (2006) The Transylvanian Basin (Romania) and its relation to the Carpathian fold and thrust belt: Insights in gravitational salt tectonics. Marine and Petroleum Geology 23, 405-442.If you are interested in volcanism, have a look at this page.Silver Fox – it is also weird that most of the turbidite formations with lots of Paleodictyon do not seem to have evidence for deep-sea vents nearby. Maybe the present-day proximity of Paleodictyon to the Mid-Atlantic Ridge is a coincidence : we see them there because these are the places we are looking at the seafloor more often and more carefully. Thanks a lot! Those two sites are endless! Nice post! I actually took a class with Peter Rona here at Rutgers and he was a great professor. The IMAX film is the marine science dept’s proudest achievement it seems; they play it given even the slightest excuse. So how do we know that these are biological at all, and not the result of inorganic pattern formation??? Cosma – that’s a question that didn’t occur to me at all. I took it for granted that it had to be the result of some kind of animal activity. It is easy to form hexagonal fracture patterns during columnar jointing of volcanic rocks or desiccation of muds; but these are planar fractures, not tunnels with circular cross section. I guess the question is, what physical mechanism could create hexagonal tunnels in fine-grained sediment? One potential argument in favor of the organic origin is the tendency of Paleodictyon to occur in close association with other trace fossils of completely different shapes (like spirals). It is unlikely that all of these are the result of inorganic pattern formation. 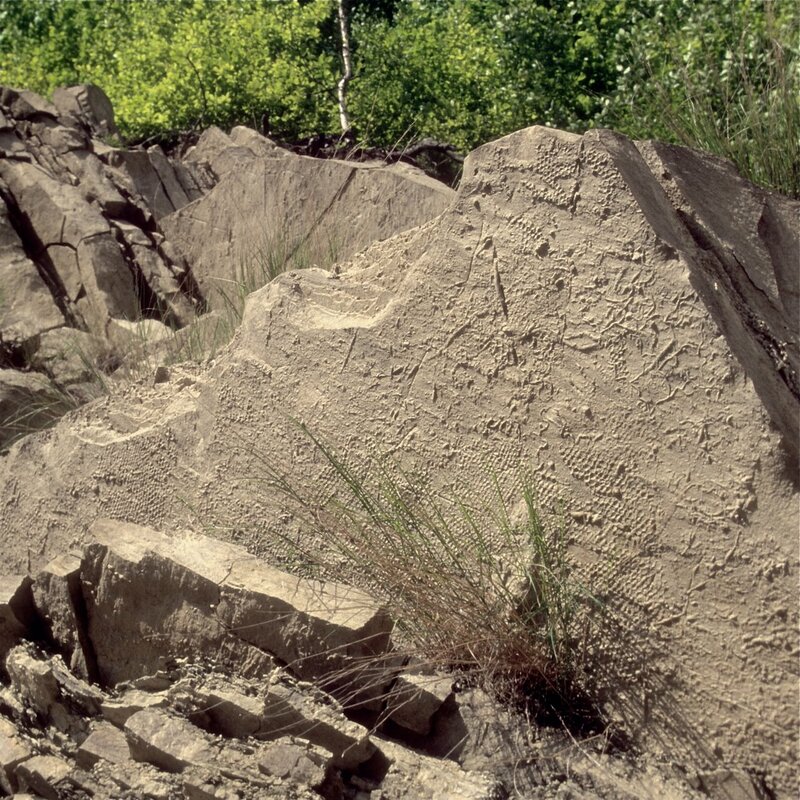 One potential argument in favor of the organic origin is the tendency of Paleodictyon to occur in close association with other trace fossils of completely different shapes (like spirals). It is unlikely that all of these are the result of inorganic pattern formation.Actually, there are a fair number of chemical and fluid-convection pattern-formation processes which can form hexagonal grids, spirals, labyrinths, etc., depending on the exact conditions. I don’t think any of them would work for these fossils, but it might be worth exploring whether others might. Is there a standard reference on them? I'm a "cereologist" for more than ten years. Sorry, but we're talking about different patterns. Bees can do hexagonal shapes and imprints, but cannot made crop formations. The only common sense here: life.Abiotic regular shapes are common either, but cannot hold an intelligent message or behavior.